The circle of the seasons is in completion. Autumn breezes blow crisp leaves across the soil now planted with dwarf peas for ground cover. Raised beds that stood tall with green stalks and flowing leaves lay fallow. The heart mellows at the sight. But the fingers call for action. After all, Wendell Berry believes that “we have neglected the truth that a good farmer is a craftsman of the highest order, a kind of artist.” Soil. Fabric. Time to make a garden quilt. 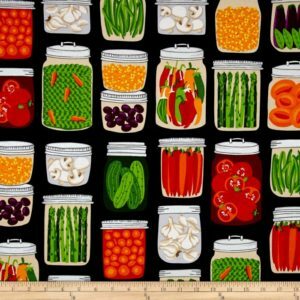 Patterns for veggie quilts, harvest quilts or garden quilts abound. But the memory of the plants themselves lend authenticity to the piece waiting to be stitched. Recall the granular feel of rough dirt between the fingers, or fine compost as it lay on the palm. Could corduroy or burlap imitate the textures and provide groundwork for the background? Maybe deep brown velvet? The soil is the basis of plant nutrition, and an integral part of the quilt. Gather samples of fabric. Sit with a cup of tea and consider the vegetables that provided the most pleasure during the summer. The tomatoes ripened in vivid crimsons, the peppers in lush orange and yellow. Pea pods hidden behind thin leaves. Eggplant hung downward on thick vines. Shocks of color veined through the Swiss Chard fronds in wild contrasts of yellow and red against dark green. Pull out the fat quarters and line up the hues needed for the flavors salivating in the mouth. Stitch. Applique. Embroider. Create the scene for the garden from a worm’s view point, or from a bird’s eye full. Add extra textures, surprising overlaps and unexpected critters. 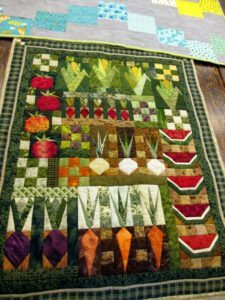 Have fun with this quilt because it will produce warm memories in a time of ice and snow as well as a blueprint for the spring planting. Dream under the garden themed comforter. The autumn is also a time for canning. “Sunshine in a jar” are my husband’s exact words for the shelves lined with pickled beets, peaches, carrots, bread and butter pickles, catsup, tomato sauce, salsa and potatoes. A winter of organically grown eating. 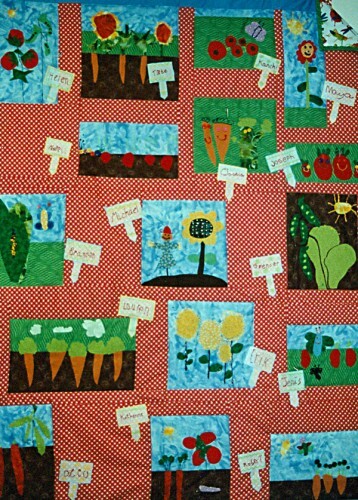 The vision of a small quilt to hang on the kitchen wall to celebrate a summer of bounty brings the garden to the table. The school bus cruises by with students who live in urban dwellings, surrounded by asphalt and concrete. A generation that is in danger of developing nature deficit disorder, a description of the human costs of alienation from the natural world in terms of behavior in children. Fortunately, groups like The Kitchen Community have furnished the metropolitan schools with raised beds, seeds, equipment and education for teachers to share ways to harvest organic veggies to overflowing classrooms. After- school programs from organizations like Common Threads bring in chefs to teach youngsters to cook and enjoy eating the garden produce that they grow. In the middle of Chicago, educator/gardener Jeanne Nolan invites children to work on their own. She allows the young gardeners to lie in the dirt, examine the worms, and taste a leaf. Winnie the Pooh’s friend, Eeyore, expresses what the children experience: “I was just sittin’ here enjoyin’ the company. Plants got a lot to say, if you take time to listen.” The Edible Garden provides the time and place for urban children to become acquainted with nature. These adults with the green thumbs toil with patience to bring the soil into contact with urban youngsters. Stitching up some mug hugs, placemats or pot holders in a garden theme for these hard working gardeners would encourage them in their mission. Community gardens abound in urban areas. Apartment dwellers, those who have shaded lawns, and condo livers have united to grow food for their tables. Most community gardens also provide raised beds that produce fresh vegetables for local pantries in the area. Their motto is: “Give a man a fish, he eats for a day. Teach a man to garden and the whole neighborhood gets tomatoes.” Friendship, fun and food dominate the atmosphere of these pollinator-laden areas in the asphalt jungle. Perhaps a quilting bee in the winter to commemorate the harvest would keep the love flowing. Gardens. Food. Quilts. A patchwork of life stitched with the fingers of those who love to play in the dirt and push needles into colorful fabric. Life giving. 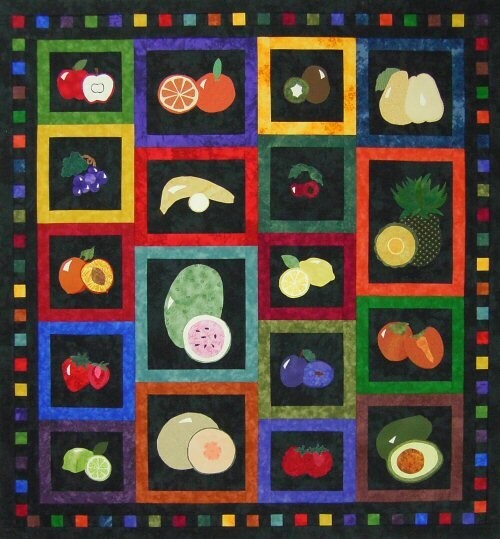 Check out my Pinterest board for more great quilts and garden pins! Join two teachers and a group of foster children as they discover all the green areas of Chicago in one action packed summer school. Who will change? 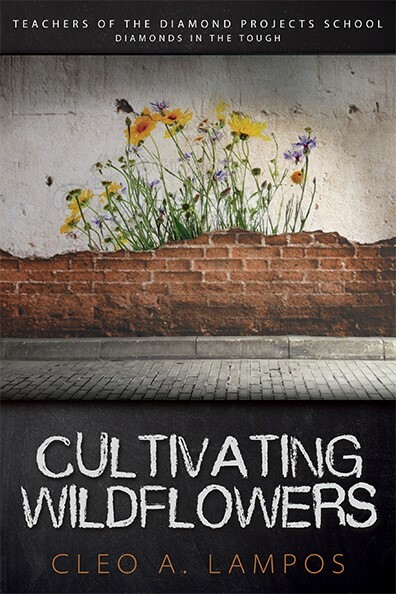 Buy Cultivating Wildflowers on Amazon today! 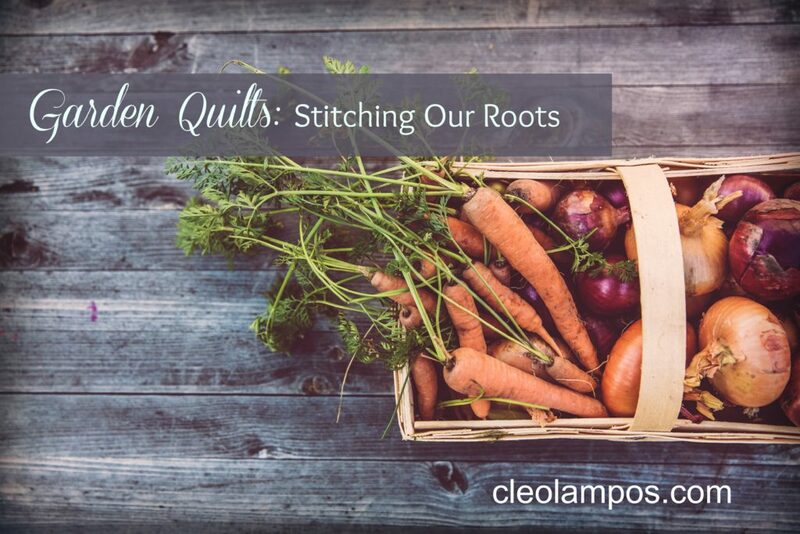 Common Threads, gardening, Jeanne Nolan, Quilting, The Kitchen Community. Bookmark.